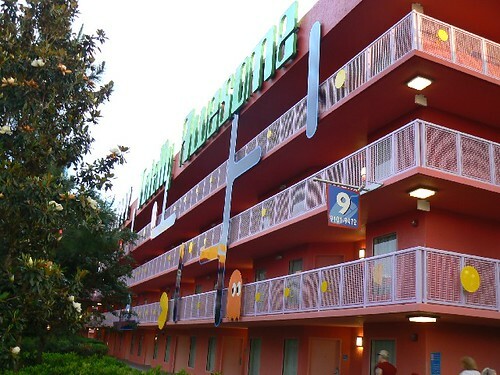 Monday morning, we decided to wake up on the early side to get a quick breakfast using snack credit at Pop Century before heading to use the Extra Magic Hours at Disney’s Animal Kingdom. We arrived at the park just after the major rush when it opened at 8:00. The place was pretty empty. 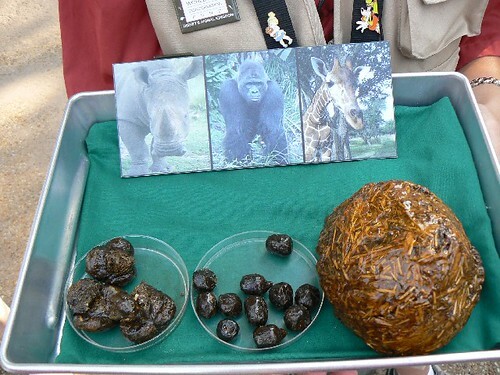 Apparently, my mother does not look at enough poop in the micro-lab at work …she wanted some on her vacation too! Once we were done with that we wandered into the park. 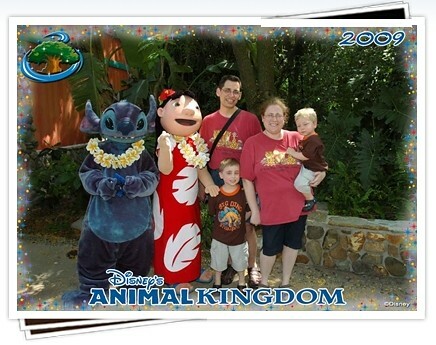 We stopped briefly to have one of the PhotoPass pictures taken. JL and I even stopped to have one of just the two of us. 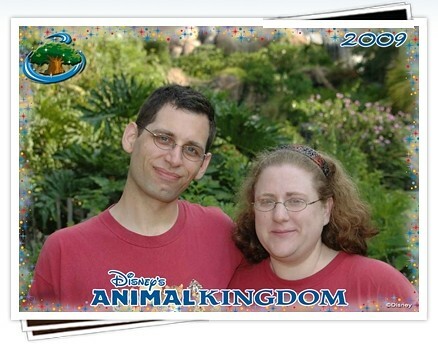 Fitting since we were wearing our matching Animal Kingdom t-shirts from our honeymoon there eight yeas ago. It was at about that time that my parents, NHL and JSL were able to catch their first glimpses of the amazing Tree of Life that sits in the middle of the park. It truly is like nothing else you will see in your life. 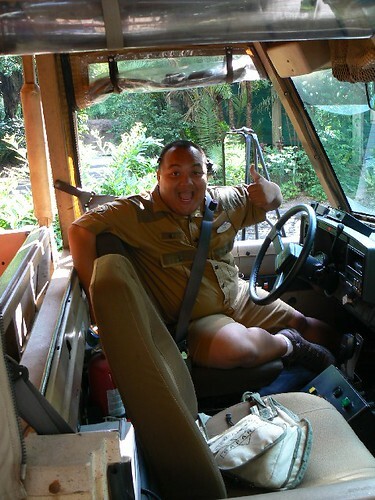 From here, we wandered our way through Asia and Africa to the Safari ride. We figured it would be great for everyone to do this together. Plus in the morning, the animals would be more active, feeding and not laying around from the extreme heat. The animals did not disappoint and we saw most of the. Of course, we are partial to a certain one that spent a lot of time near our group. Many of the giraffes were out and two of them kept blocking the road and were even following our vehicle. Here are some photos from our adventure. 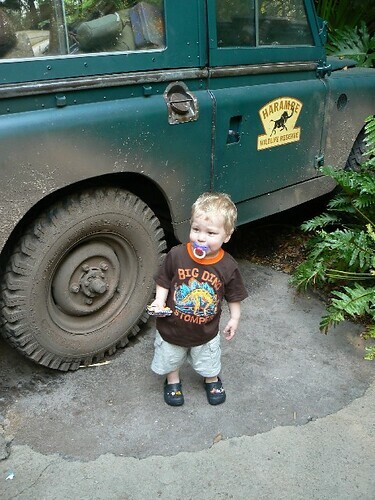 Of course, JSL wanted to go back in the car car for another ride to see more animals. Also note, he was obsessed with holding onto a park map each and every day. As you will see, his little hands have one in this photo. 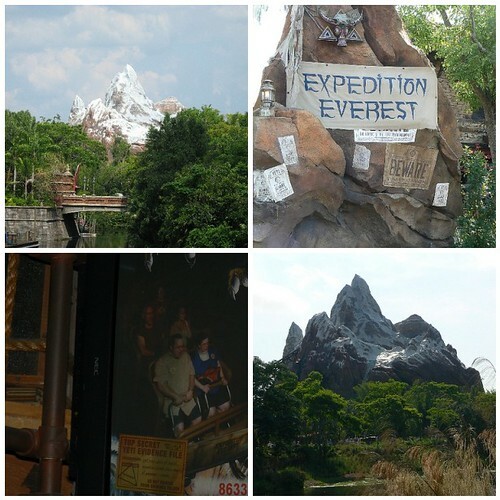 When we were done with this, NHL really wanted to head toward Expedition Everest. We figured it was a good idea. We would walk over, get a Fast Pass for Papa, NHL and I and then go back later. We were floored when we walked up and the standby line was 15 minutes. Thanks to that we hopped right onto the line. The information about the Yeti and expedition teams that you can look at while on line are amazing. When it was time for the ride, NHL sat next to me and Papa rode in front of us. All I can say is it was a WILD ride. It was like no other coaster I have been on. Thanks to the darkness you never see what is happening as it moves you forward, then back and forward again. From here, we went to get a Fast Pass at Dinosaur. Once again, there was little line. I grabbed a child swap pass since JSL was too small to ride. Nana, Papa, JL and NHL went on. JSL was getting really tired. We walked around while waiting for everyone to come back. 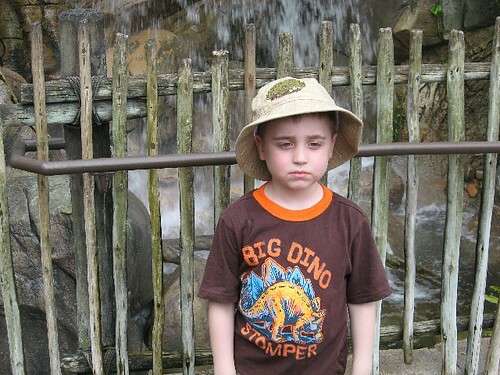 In fact, once he was asleep I went to get on the line for the Finding Nemo stage show. I waited there for the rest of the group to catch up. 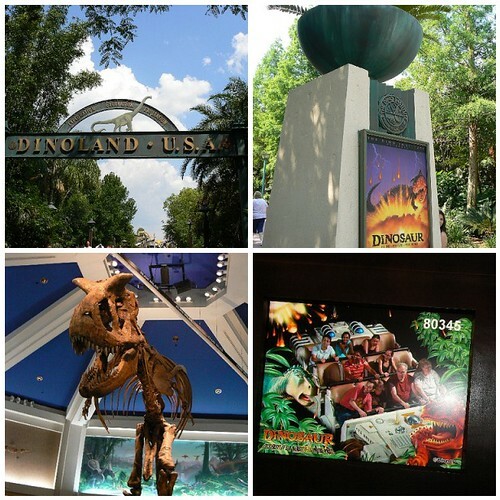 Here are some photos from Dinosaur. As you will see NHL was not a fan, so I did not get to go back on it. No big loss to me since I was not in love with it when I went on eight years ago. Finally the rest of the crew met up with me at the Finding Nemo theater. This is a TOUGH show to get into. They actually have guaranteed seating for people that make reservations at certain times at restaurants in the park. We quickly got seats and JSL stayed asleep the entire time. We had heard that this show was amazing and like a Broadway production. It was that and more. NHL sat there mesmerized and could not take his eyes off of the actors and puppets. The colors, scenes, music, singing, dancing and everything were amazing. We were all surprised to see that it was a forty minute show. Here are some highlights. Once the show was over we wandered back toward the front of the park to the Pizzafari to have lunch. This was a great big air conditioned restuarant where we could use our quick service credits. Everyone was hungry and gobbled up pizza, salads and more. Even JSL woke up and had some pizza. After eating, we decided to split up and wander around without my parents. Of course, this did not last long when we saw the It’s Tough to Be a Bug show was starting soon. 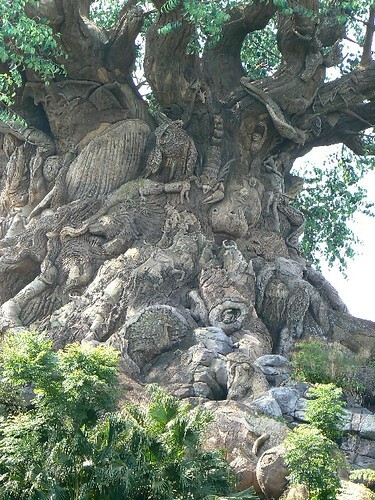 I called them on their cell phone and they met up with us by the Tree of Life. Needless to say right before they were going to let us into the theater for the 3D movie, NHL decided that he had to go potty. Thank goodness Papa was not thrilled about seeing this show and volunteered to take NHL. It was a good thing NHL left when he did since the show may have scared him. JL, Nana and I enjoyed it and, well, the little guy tolerated it. Here are photos before NHL left of him withe his Bug Eyes on. Mom was right, so next we went back to the stores to look for a new safari hat for JSL. We eventually found a cute one with Mickey and Minnie on it. At that point we split up again and said we would meet before heading to Boma for dinner. None of us thought we would be able to make the Festival of the Lion King. We thought it would be a nice time to try to get some character photos with the boys. We went toward Camp Mickey and Minnie. 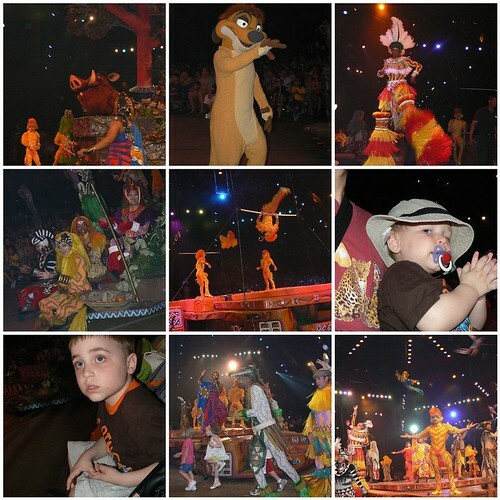 When we got inside we saw that they were about to start the Lion King show and were still taking people inside. We jumped at the opportunity. JL and I had not seen this on our honeymoon and were upset since everyone raved about it. The show truly was a spectacle. It made you feel like part of a tribal celebration. 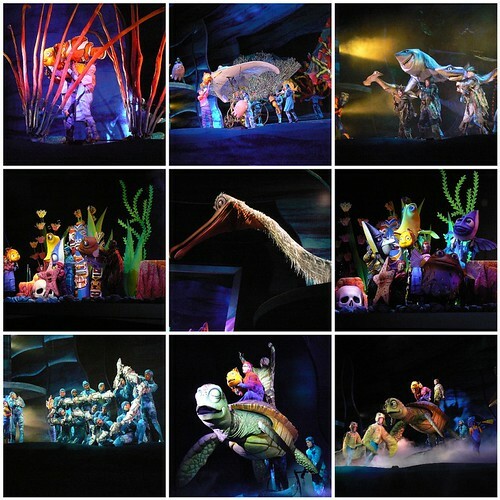 The costumes, colors and dancing took you into the Lion King. Here are some photos from the show that both of the boys loved. Once again NHL refused to have photos taken with Mickey and company. On the way back to Dinoland I spotted someone that I thought just may work. Waiting with almost no line was Pocohontas. I figured she was a great person to start with and work our way up. 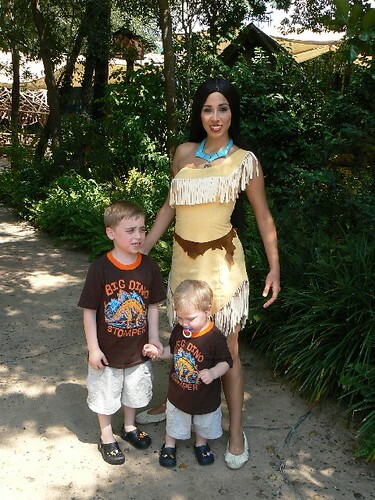 Please note the looks of confusion on the faces of the boys who had no clue who she was. Just around the corner from here I spotted Lilo and Stich. There was also a PhotoPass photographer there. The boys allowed us to take a photo with JL and me in it. So here is our family portrait. 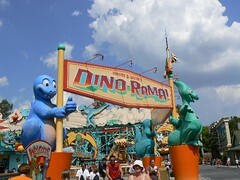 From here we went to Dinoland and the boys were excited to go on the Flying Triceratops. 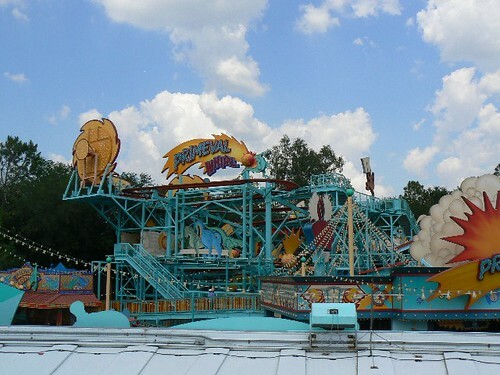 There was no line and we were able to go on them twice before we had to head off to meet Nana and Papa. 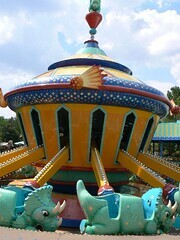 FYI – the flying dinos are basically a new and improved version of Dumbo the Flying Elephant ride that is in the Magic Kingdom. Had we had a few more minutes I would have loved to ride on this, but NHL was not tall enough so I passed. When we made our way back to the main area to meet my parents, the parade was just ending. Of course, that is where we happened to bump into Nana and Papa. 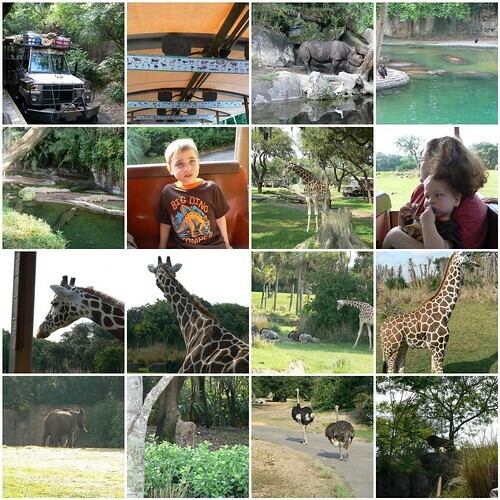 So we waved goodbye to Mickey and went to get a bus to the Animal Kingdom Lodge. As we were waiting on line for a bus, we heard someone calling my parents. Sure enough, we saw my brother’s friend, his wife and their little girl. 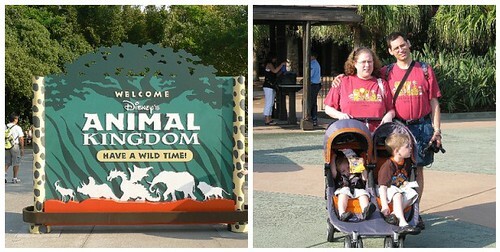 They were also in Disney for the week and were heading to Boma for dinner as well. It still amazes me that in a place so large we bumped into someone we know. 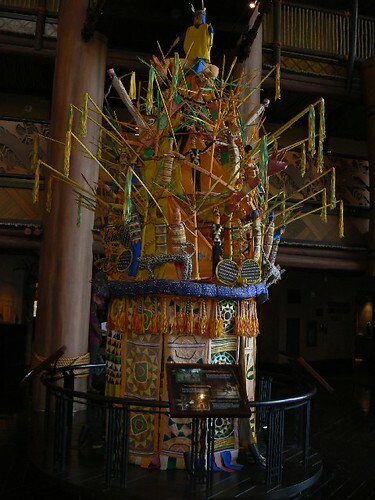 When we arrived at the Animal Kingdom Lodge we checked in and looked around the lobby. There were actually two PhotoPass photographers. We took the opportunity for a group picture before we went to dinner. Our beeper was going off before we knew it, so we wandered down to Boma for our meal. We had heard that this was an amazing array of African inspired food and was vegetarian friendly for JL. The buffet was amazing and each of us quickly found items that we adored. If I have to pick my favorite meal of the trip this would probably be right up there. 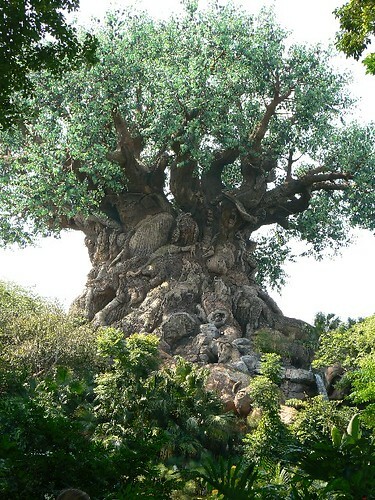 We will definitely be going back to Boma when we go to Disney World again. 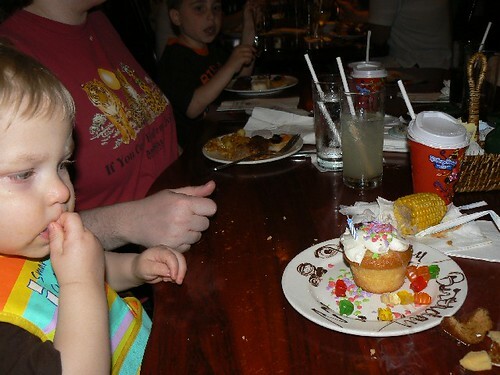 Another item that impressed me was our server noted that we were there celebrating JSL’s birthday. Without us saying anything she brought him a cupcake and sang to him. Very classy (please note this for when I review JSL’s actual B-day dinner). After our meal, we wandered to the gift store at that resort. We bought a Disney Princess post card to send to my niece and got each of the boys a Disney safari character. NHL picked out Goofy and JSL selected Pluto. 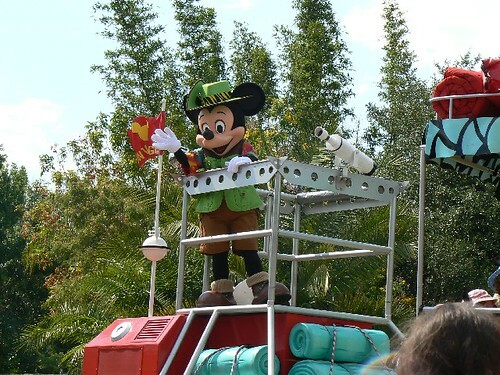 From here, we took a bus to the Magic Kingdom and transferred back to Pop Century. JSL quickly fell asleep on the bus. When we got back to our room, NHL was still ready to go. We decided to let him go swimming with JL. Papa stayed back in the room with JSL to watch television in the AC. Nana went with me to wander. The boys were in the 80’s computer pool right by our room. Nana told them about the Goofy Spray area and Hippy Dippy Pool (better photos from the day coming soon). Thanks to that, we all went to explore the resort more in the "cooler" evening temperatures. 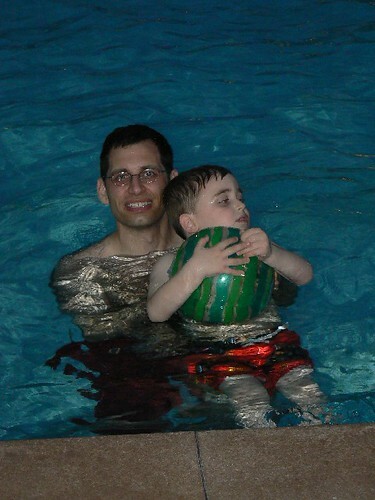 We were eventually able to pull NHL away from swimming and head back to the room. When we got back JSL was starting to stir. When we took off his sandals, we noticed blisters on his little feet. We put band-aids on them, showered everyone and went to bed. Up next, our first full day at the Magic Kingdom and dinner at The Wave. Brea’s Mommy’s last blog post..All I want to do, All I want to do is SLEEP! Looks like a lot of fun. I like how you arranged all the pictures, I bet there were still tons more though. 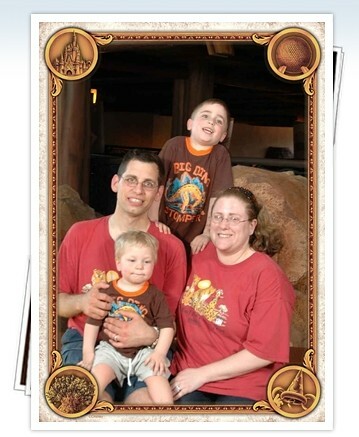 What are the photopass things? How much do they cost? Do they e-mail you the pictures? 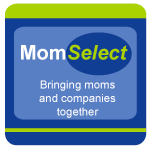 I`m just gathering information for when we take our family there one day. I`m looking forward to it. 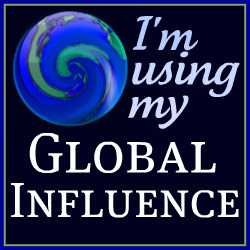 I am LOVING your write-ups of your trip. And am now really, really wanting to go!